1 of 2 Line a baking pan with foil. Place scoops of sherbet on baking pan and freeze until ready to serve. 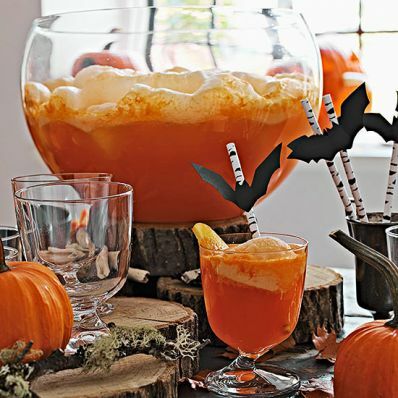 2 of 2 To serve, combine orange juice concentrate, ginger ale and seltzer in a punch bowl. Top with scoops of the sherbet and orange slices. Drape gummy worms over rim of punch bowl, if desired. Per Serving: 34 mg sodium, 1 g pro., 1 g Fat, total, 147 kcal cal., 2 g fiber, 33 g carb., 1 g sat. fat, 0 mg chol.